In an effort to better serve our retail customers, we have recently released an update to the manual for our retail Touch POS software. If you are a current Touch POS customer or simply looking for an affordable retail POS solution, please take a moment to look over this manual. 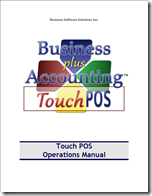 This manual includes the latest features of BPA Touch POS including advanced tare options for yogurt sales and advance coupon configuration along with many other new features. Here at Business Software Solutions, we understand how important it is that you, as a business owner, keep tabs on your daily sales figures. To assist you and your business partners in this process we have added additional functionality for you to keep track of you sales even when you are away from your business. 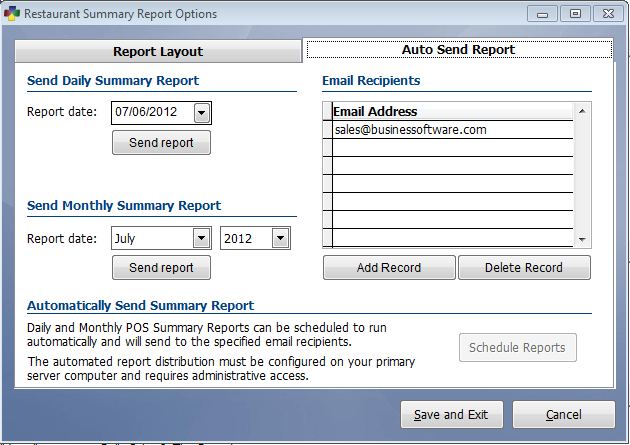 Now the daily sales report can be automatically e-mailed to you and your business partners every day. 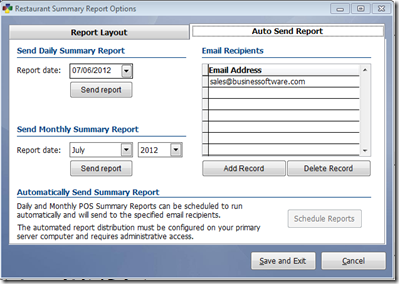 The report can be scheduled to send directly from the Misc. Definitions screen. You can also configure the report to include or exclude certain portions of data that may or may not apply to your business. We have also updated the daily sales report. We now allow it to be printed on your receipt printer or a full size document printer as well as giving the option to run the report for multiple days. If you are interested in using this functionality please call our technical support department at 801-336-3303. We can assist you in updating your software and configuring this new functionality. Please note that to use the e-mail functionality you must have a compatible e-mail provider. Please contact technical support for more information.